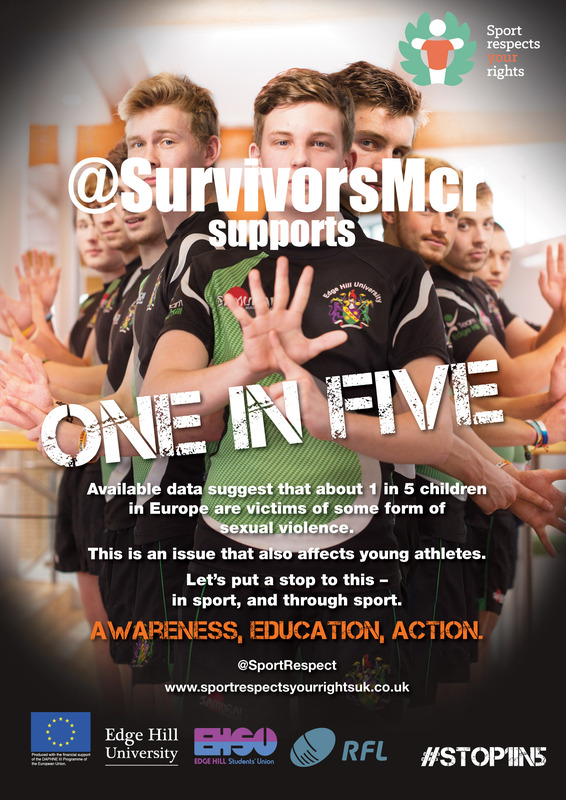 Survivors Manchester recognises that for many many men, sport can be a huge part of their childhood, teenage years and adult life, whether as a participant or spectator. But for some, sport is also linked to the sexual violation they suffered in early years or even more recent. Over the past few years, the sexual abuse of children and young people in sport has very much been in the spotlight with the high profile case of Jerry Sandusky in the USA and a number of sports men and women taking a stand and speaking publically of the sexual abuse they suffered by their sports coach or team manager. In the states; Raghib Ismail (NFL), Greg LeMond (Cyclist), Jaret Peterson (Olympic Speed Skater), Kenyon Dooling (Basketball), Greg Louganis (Olympian), Theo Fleury (Ice Hockey), Laverneus Coles (NFL), Mark McGwire (Baseball), Micky Ward (Boxer), R.A Dickey (Baseball), Sean ‘X-Pac’ Waltman (WWF Wrestler), Sheldon Kennedy (Ice Hockey), and Sugar Ray Leonard (Boxer), have openly talked about experiencing sexual abuse as children. Whilst in Europe and here in the UK; Patrik Sjoberg (High Jump), Andy Morrison (Football), Brian ‘Pitbull’ Moore (Rugby), and Alan Brazil (Football) have stood up to be counted and said “I was sexually abused”. As sport can be both a source of painful memories and a source of healing for many men, its important that we understand and so have chosen to support the fantastic work being undertaken by Dr Mike Hartill, Senior Lecturer in Sociology of Sport at Edge Hill University, who is looking at male survivors of abuse in sport. Sport continues to occupy a special place within the early years of boys’ lives and we have a rich sporting folklore based on heroic feats of skill and endurance. Sport has also been the site for a great deal of sexual abuse against children. Yet the vast majority of this abuse remains untold and unheard; the sexual abuse of children remains a hidden aspect of the history of sport. During the past decade, in the wake of high-profile cases of sexual abuse by male coaches, British sport has seen the introduction of child protection and safeguarding policy (although not without considerable resistance and criticism). However, as survivors have always known, a great deal of abuse has been concealed and covered-up. As cases across the world have illustrated, sport organisations have also been complicit in concealing the sexual abuse of children. Research on sexual exploitation and abuse in sport and physical education has been on going since the late 1980s, yet there is virtually no published research on the experiences of male survivors of abuse in sport. It is crucial that survivor voices are heard by policy-makers and play a central part in the future development of sport and school-sport. It is also crucial that the wider sports community hears about the abuse perpetrated within sports contexts and it is through survivor stories that our sporting communities will come to better understand sexual exploitation and abuse. And it is knowledge and understanding that will best protect children. Mike holds a PhD in Sociology and lectures in Sport Studies at Edge Hill University. His principal areas of research include child maltreatment and sexual exploitation in sport, and child protection in sport policy. He work’s with a range of local, national and international organisations. Mike recently co-ordinated a research evaluation of child protection policy in UK Rugby League and served as a Scientific Advisor to the German Sports Youth project on sexual violence in sport (check out www.dsj.de/childprotection). Mike has also advised the Spanish Sports Council (CSD) and the European Commission in relation to sexual abuse in sport. He is currently coordinating the UK element of the EU-funded international project ‘Sport Respects Your Rights’ (2013-2015). In partnership with colleague Dr. Melanie Lang, Mike has edited an international collection of research on safeguarding and child protection in sport for Routledge (published July 2014). He also sits on the national Child Protection Research & Evidence Advisory Group (REAG) (2003) chaired by the Child Protection in Sport Unit. This research project aims to facilitate the telling of survivor stories by those men who were abused within a sport or PE context. The research will be used for the purposes of developing sport-based resources and will be published in a forthcoming book. Dr Mike Hartill has agreed to be a regular contributor to our website and create a monthly research diary blog, giving you the opportunity to hear what’s going on. Sport Respects Your Rights is a campaign co-ordinated by Dr Mike Hartill and closely supported by the Lawn Tennis Association and the Rugby Football League. Their aim is to challenge sexual and gender-based violence, exploitation and abuse through the empowerment of children and young people in and through sport contexts.